Similar to whole-body vibration using a Hypervibe machine, the HyperVolt from HyperIce provides many similar benefits in a more ‘on-the-go’ type of way. With recovery becoming an integral part of the healing process, it’s important for the technology to be accessible at home. 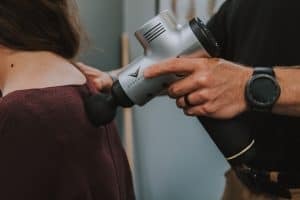 The HyperVolt helps to relieve muscle pain, stiffness and soreness as well as increase range of motion, circulation and blood flow — all in one, powerful device. Using the HyperVolt to warm up and cool down can prime your body for a tough workout and help return oxygen to your muscles afterward — which further aids in recovery. Interested in more info or wish to purchase your own HyperVolt? Fill out the contact form below and one of our team members will reach out to you as soon as possible! Contact us about purchasing a Hypervolt!